Howdy all Tim here. New to the forum. General all around tinkerer and musician. I am putting this Meteor ME301 together and could likely use some guidance/suggestions. I've managed to heek up the electrical. Using the foot operated treadle, I can change the speed of the motor. I have figured out the counter more or less. I have not figured out the automatic back and forth action of the feed. Does anyone here have a manual for the machine? or perhaps experience with them? I'd rather not damage it while experimenting. Welcome to the forum and thanks for the PM. I'll try to address your questions here to the best of my ability. -----The overall condition of the machine mechanically. With the machine unplugged and off, I check for broken or missing parts, seized parts, binding parts, gear lubrication, broken gears, bent shafts, sleeve and ball bearings, proper oil levels in such equipped models, etc, etc. -----The overall condition of the machine's wiring. With the machine unplugged and off, I look for cracked wiring, proper fuses, frayed wiring, loose wires, burnt wires, etc, etc. And repair or replace as needed. Caution some electrical components, like capacitors, can contain lethal voltages even with the power off and the unit unplugged...Only do the electrical inspection and repair yourself if you are qualified and knowledgeable to do so. 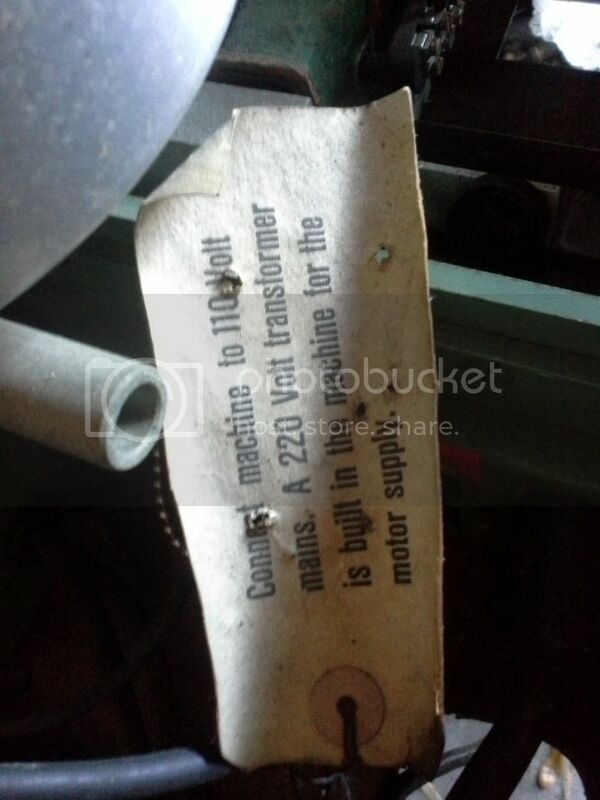 Once I establish that all is well with the machine, I also inspect the motor and drive belts in the same manner. I know some winders here actually take the motor to a "Electrical Motor Repair Shop" to have it checked out before powering up. The same safety rules apply here as stated above. You must also understand how the machine operates and the safety features & protocols of each different type of machine. Know the mechanical features of the machine and how the traverse systems works. Know the parameters of the machine's operation. On some machine brands a wiring diagram is extremely helpful if not a requirement. If everything checks out and with a good understanding of how the machine operates, AND still with the unit unplugged & power off, I try manually rotating the drive shaft to see if anything is binding. Rotate only in the direction the machine is designed to operate as some machines only wind in "Top-Going" or "Top-Coming" directions. Some can operate in both directions. Operating a machine in the wrong direction can damage the machine and/or the counter. If everything still checks out, I try to power up at a very slow RPM and increase gradually if everything is still good. Know how to shut down the machine quickly in case of emergency. When inspecting any winding machine internally, and taking any parts off, make sure the machine is unplugged and the power is off. Always observe proper safety protocols keeping hands, fingers, hair, sleeves, etc away from any moving parts and electrical parts/connections. Always wear the appropriate eye protection. Most people's experiences with the Metoer ME301 as noted in various threads here in the forum, include replacing the Friction/Drive Disk. DO NOT operate your machine with a damaged or missing Friction Disk. DO NOT turn the knob that moves the friction disk while the machine is not running. Check the two plates that the friction disk touches for damage or scoring. Fortunately you maybe can buy some replacement parts from a couple of sources (see Meteor's web site and Start - Wickelmaschinen - see Thread called "My New Winder" here on the forum). Do a Google search for Manuals for the machine and see if you might find one. IMO a manual is very important to have when working on any machine. Your machine visually looks to be in very good condition and hopefully on deeper inspection will prove to be the same. Hope this helps... good luck and keep us posted. Last edited by Jim Darr; 04-10-2016 at 05:14 AM. HUGE THANKS for the welcome and the info. I must confess, I have powered it on and I have used the foot control. I've messed with the counter some. All of that appears to work. I may have turned that knob though without it being on but honestly, it was about the same as a button that says do not push. I'm about to head home to take a look underneath at what I suspect is the spot where the friction disc is. what does the do not turn knob do anyway? I'll keep everyone posted on the nonsense. OK so this is the part I think is related or is the friction disc. It seems that the parts are in good shape. Still not sure what that dial does, but there seems to be a cord from it to the dial indicating wire gauge? Ok I think I'm getting somewhere. The two discs here have what "may" have been some rubber wheel between then that the no not turn handle is mounted to. Whatever that material was, needs to be replaced I'm thinking. The other mystery is the rod with the ball ends. It operates some lever, but I'm not sure what purpose it serves. Your last picture tells the story of the friction disk. Yep, it looks bad and also looks like somebody tried to overcoat it in some way to increase the life. Try to replace it with a factory OEM unit if you can (see same topic in detail on previous forum thread "My New Machine"). Two recent purchasers had the same situation as you. They list sources for the replacement friction disk. I have not used these sources so I cannot vouch for them. The knob should read "TURN ONLY WHILE MACHINE RUNNING". That knob moves the friction desk mechanism relative to the two plates. Turning it while the machine is not running can cause undue wear on the disk and the two plates. Your plates (well we can really only see the surface clearly of one) seem to be a fair shape. Check them for any scoring, gouges or residue. They should be fairly smooth. Last edited by Jim Darr; 04-10-2016 at 12:56 AM. The discs appear to be in perfect shape. there is some goo on them but no grooves. I'll see about grabbing up a new wheel. Then I need to figure out some of the other functions. I'm moving pretty good so far thanks to you and reading the forum. Last edited by MBL; 04-09-2016 at 10:43 PM. Here are some pics for what I believe is a tensioner. It also has a dial for voltage, although, I'm not sure if I should be operating at 110 or 220. the outlet is 110-120 US standard houshold. Figured it would be safest to operate at the lower level till I figured it out. Here are some more pics. Dial and tensioner. Great pics. Most of the tensioner systems are some type of spring loaded mechanism. I am not familiar with these you show, so I can't really offer any insight. The units that came with some of my winders were typically spring loaded and, IMO, hard to get a constant pressure on the wire. Maybe some of the other members can chime in. I have come up with a system using felt pads I use for my different winders that seems to work well. For this machine my insight really is in the drive friction wheel area as the ME301 is almost identical in principle to a machine that I have. Concerning the electrical portion of your winder, be extremely careful, especially with a transformer converting 110 to 220 volts as your last picture shows. Use extreme caution as some electrical components, like capacitors, can contain lethal voltages even with the power off and the unit unplugged. Only inspect the electrical systems and work on it yourself if you are well qualified and knowledgeable to do so. Hopefully others here will offer their perspectives on the set up of this machine and trouble shooting it. Thanks. I sent an email to the folks that seem to have that rubber part. we'll see what they come back with. The voltage I'm keeping dialed at 110 for now until I learn otherwise. I figure it's safer that way. I'm a little confused about how the foot control works. it seems different depending on if you have the ball end rod hooked up or not. I likely will be buying the manual soon. hopefully it clears up some of this mystery for me. It seems to be a high quality machine although I think perhaps overengineerd to an extent. Looking forward to getting some bobbins wound. Most of the tensioner systems are some type of spring loaded mechanism. I am not familiar with these you show, so I can't really offer any insight. The units that came with some of my winders were typically spring loaded and, IMO, hard to get a constant pressure on the wire. Maybe some of the other members can chime in. I have come up with a system using felt pads I use for my different winders that seems to work well. Completely mechanical tensioners typically have a mechanical brake retarding the rotation of a capstan around which the wire being fed is wrapped and a dancer arm that adjusts the drag on the capstan such that the wire tension is more or less constant. If the tension is too high, the arm is pulled towards the spinning bobbin, loosening the brake reducing the tension. There are a million designs. For pickup winding with 42 and 43 AWG wire you should be setting your tension at or near the lowest tension -around 15g max. I find that 7-8 grams is plenty. The knob that shall-not-be-turned is the one that sets the traverse pitch or turns per layer if you will. I'm running an ME484 and sometimes ME483 for tension on my Geo Stevens...looks like yours is toast. 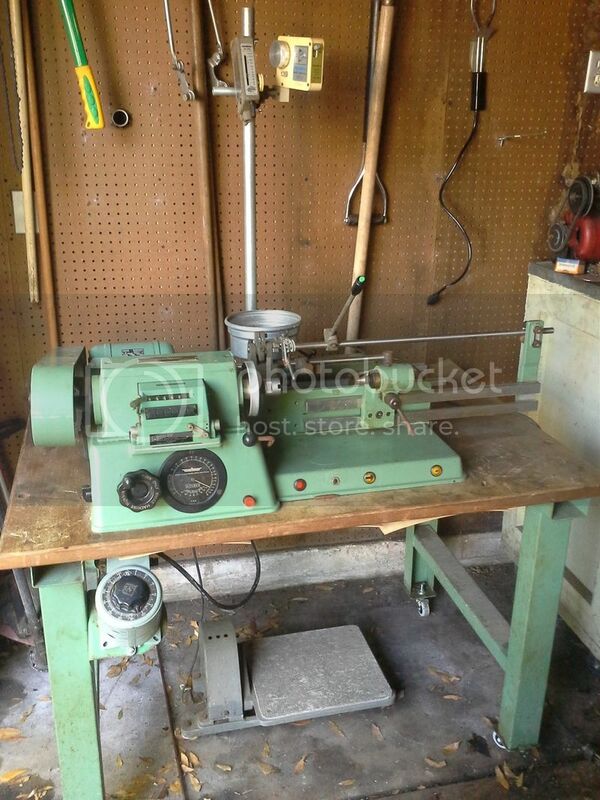 Parts are impossible to find and expensive when you do (like all these machines right?) so you might have better luck trying to run the yellow thing for tensioning. If you do manage to get parts for the 484, I can explain how it works and show you the wire path. It's a bit weird but a fantastic piece of machinery with few drawbacks. From the pic, your one pulley is destroyed and it looks like you're missing the dancer arm and tensioning swing pulley that sits to the upper/rear. Thanks for the info! here's a little better pic of what all the tensioner has with it. I'd for sure need to replace the plastic pulleys, but is this not something I could have made? Is there a patent number anywhere on it? That's your best bet for figuring them out. I do recall seeing patents. I suggest you contact Meteor (info@meteor.ch) for the winder and tensioner manual. I did that three years ago for ME307 manual. They were very responsive, I received the manual next day. Well, I went and got one of those wheels on order. I promise not to turn the knob without the motor running. I do need the manual. Baby steps I suppose. I did do some cleaning up of the machine. Hello Tim. I have an ME 301 B, too, that i have been restoring. Hope yours is going well. PM me and we can keep in touch. I recently had to fix the relay module for the indicator lights by tracking down the proper relay specs and ordering a replacement from Mouser. I also found a lower cost fix to the friction wheel with the same specs as the original. Let me know if you are having success witht the restoration. Welcome to the forum MBL!